Enjoy the wait in our comfortable sitting area while we provide Land Rover and Jaguar maintenance service at DJ Foreign Auto Care in Minneapolis. We cater to you while we service your car. In addition, we provide Wi-Fi service, local shuttle services, and vehicle pick-up and delivery. We’ll even wash your car if weather permits. As with all of our services, if you want to leave your car with us overnight, we can arrange for discounts on local car rentals. When it comes to a quality Jaguar and Land Rover maintenance service, you’ll enjoy the best at DJ Foreign Auto Care in Minneapolis. If you have money to burn, go to the dealership when you need Jaguar maintenance service. However, if you’d like to save money while we pamper your luxury car, our ASE-certified technicians provide prompt, accurate, and affordable Jaguar and Land Rover factory-scheduled maintenance in Minneapolis. We also do tune-ups for other foreign-made cars, such as BMWs, Audis, and Mercedes. Most importantly, we are very familiar with the proper way to tune-up and maintain your exact model. Proper Jaguar factory-schedule maintenance is important not only too keep your warranty in force, but to ensure a smooth running vehicle. Whether you need a Jaguar tune-up or Land Rover factory-scheduled maintenance, our Minneapolis technicians are fully equipped to provide exceptional vehicle services. 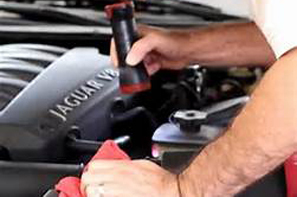 What’s Involved in a Jaguar Tune-Up? When you come to DJ Foreign Auto Care in Minneapolis for a Jaguar tune-up, we provide comprehensive services that ensure your sports car or luxury car is fully operational. From replacing spark plugs and spark plug wire sets to changing filters and replacing O2 sensors, we completely service your car to improve its engine performance. The new Land Rovers can go many, many miles before requiring tune-ups. However, if you have an older model, it’s a good idea to bring it to our auto repair shop for servicing. We provide prompt, precise, and affordable Land Rover tune-up services for customers in Minneapolis and the Twin Cities area. Keep your warranty current by depending on us for Land Rover factory-scheduled maintenance as well.